TL;DR BountyDash was created by @fransrosen and @avlidienbrunn to create a better overview of your bug bounty rewards. 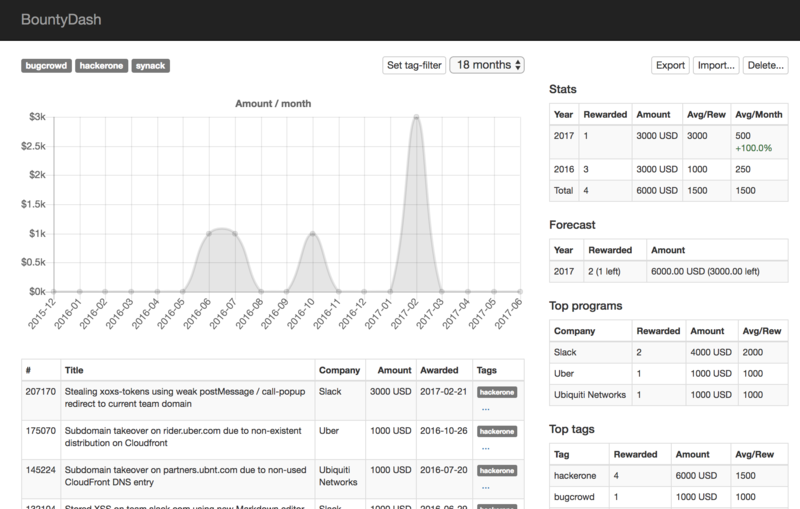 By tagging all your reports in the tool you’re also able to categorize all vulnerability types, plotting up a graph around your activity cross platforms and get forecasts around your future findings. Everything runs locally and there are import scripts you can run to fetch the data from each platform. Since we both have submitted quite a bunch of bug bounty reports since 2013, we felt that we had to consolidate how we structured our findings. We both kept spreadsheets with all info, but there had to be a better way. We then started to build BountyDash. 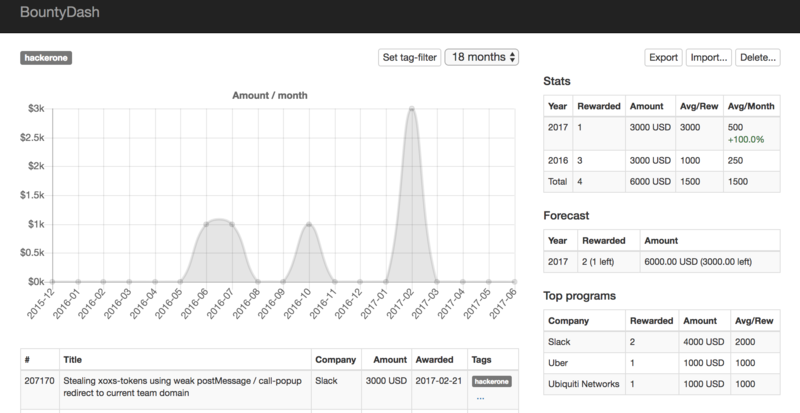 By just creating a quick import script, saving the data to a JSON-blob, we were able to start calculate some fun statistics about our activity, and also gain insights in how we actually look for bugs. My biggest revelation was that I actually do big pauses of up to 1.5 months long about every 3 months. This is a natural way for me to dig into something and then step out to not get too fed up. 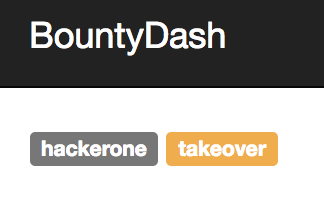 I use BountyDash to make sure my bounty reporting/rewards is in line with my goals, I also tagged every bug that came from automation which made it easy to track those goals too! If you get something good out of the tool, like our realizations above, we would love if you use the hashtag #bountydash so we can share the knowledge further. First, yea, we do PHP here! 🙂 The PHP is not calculating any of the stats, it’s only sanitizing and normalizing the data when importing + saving and loading the JSON-file to disk. The following methods are used import_source, delete_source, delete_tag, add_tags and add_tags_from_filter. NB: We haven’t secured this app in any way (Hello CSRF) so keep this instance for yourself somewhere nice. There’s a Taxonomy part below that explains the concept of the naming convention in this app and what everything actually means. If you like, please read that one before you start. You need to start import reports for it to make sense. Let’s start with exporting my rewards from one of the platforms. You can find howto’s in the import/ folder of the repo. Click Import... in the top right corner. 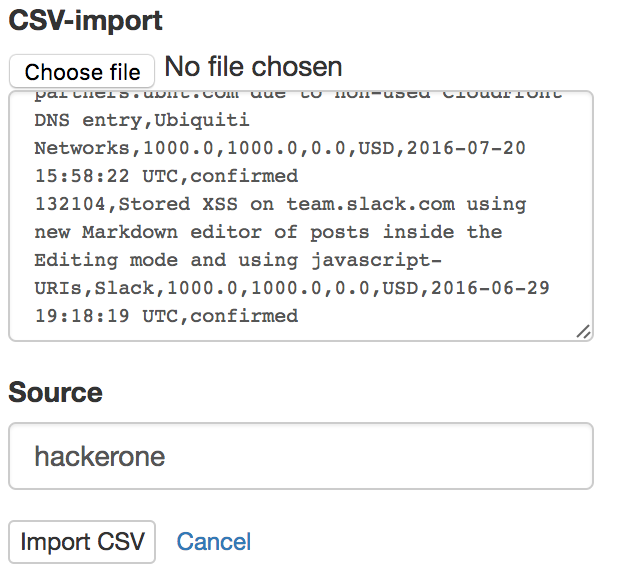 You’re now able to either import a file directly or pasting your CSV-content in the box. You also specify a source. We can now start tagging our findings to get some more insights. In the upper right side of the graph, there’s a date-selector for the stats but also button saying Tag-filter. This means that you can use a filter of your report’s Title-field to add a tag to multiple reports. Every report with a title matching the filter will now get the tag, the stats will update and the tag should be visible in the top. Clicking on each tag will select it and update the stats accordingly. If you like to add tags to a specific report, there’s a ...-button in the Tags-column. will delete the tag completely. Deleting it from the report list on a specific report will only delete it for that specific report. id, status, date, amount, currency, program, title and source. We have seen some instances where programs have changed name after a while but it has been on rare occasions. That would create duplicates of the reports since the hash would differ. What’s good about this dupe detection is that it supports multiple rewards on the same report. Even though the CSV contains more fields, we are only using the ones above. Since we didn’t bother to do any real CSV parsing, we used some shortcuts to separate the values taking some stuff for granted of the data set getting imported. CSV always begins with a header, ignore it. Row begins with ID first. Status is next, but we set it to sent always anyway. Date is next, we hope it’s ISO-formatted, might be T-separated or using space, we normalize that. Ignore the next to columns. Total is next. Should be an floating value with dot-separator. Program next up. Our bookmarklets doing the CSV now actually removes the occurrence of commas in the program title. Title. Might be wrapped with ", if so, remove that. This is not our proudest moment, but it does the job for now. You can also export the JSON using the export-button. There’s also a Delete...-button. This one can be used to delete a specific source. This will actually delete all reports with that source. It’s great if you want to clear up and import stuff again from a specific source. tag is a phrase you add to each report. You will be able to filter on these in your stats. source is where the report came from. It works as an additional tag, but will also have its own separate stats. Company is the specific program that the reward was given from. Title is the name of the report that was sent to the company. Report is the actual row in the data storage, containing info about the bug that was reported to what company and from what source. Amount is the rewarded amount. We currently do not officially support multi currency (We’re open to PRs though!). Awarded is the date of the reward. 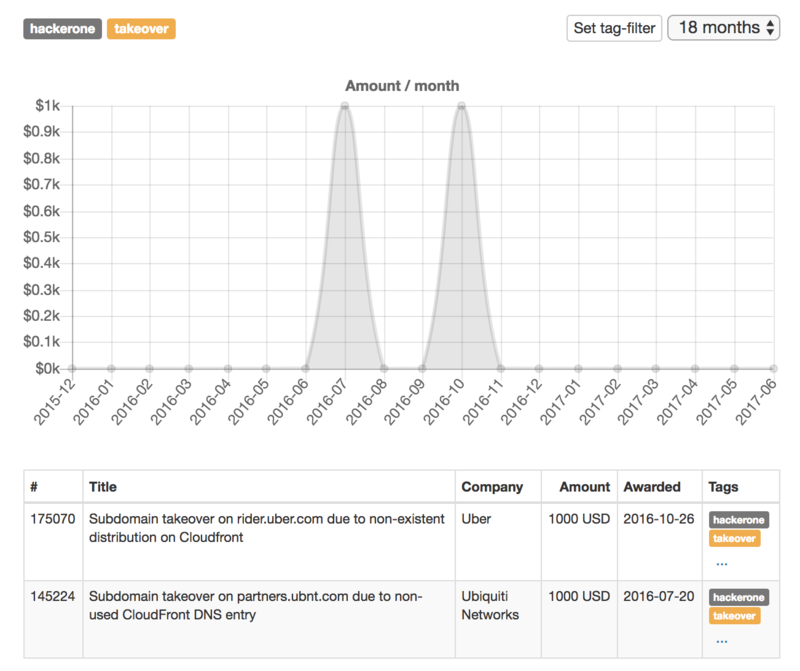 Rewarded is the amount of reports that resulted in a payout. Rewarded 10 for 2017 means you had 10 reports that was rewarded in 2017. Avg/Rew means Average amount per Reward. Avg/Month means Average amount per month. This also shows the increased percentage from the year before. The bookmarklets are included in the import/ folder in the repo.